How and when did you feel the need to start Practo? Was it based on a personal experience or did you simply see it as an existing gap in the market? We started Practo with the vision to help mankind live healthier, longer lives by making better healthcare decisions. In 2008, when I was still in college, my father had to undergo a knee replacement surgery and to get a second opinion from a doctor in the US, I wanted my doctor in India to provide me the health reports digitally. To my surprise, he couldn’t do it because his software was missing something as simple as an email button! This led to much frustration as I had to manually take photos of the records, upload them into my email and send it to the doctor – who then came back and said some of the photos weren’t clear and I had to redo the process. I figured that there must be a better way! So me & Abhinav Lal built Practo Ray, a cloud based practice management software which helped doctors manage their practice and helped digitize their patients’ records and made it easier to share it with patients. Today we have over 90% market share amongst practitioners using some kind of online practice management software. In 2013 we launched Practo.com to help people find the best doctors and book instant appointments. Today 1.5M people visit us monthly to find the best doctors for them. How much iteration did it take from the initial idea to the current product? How did you get your first few customers? What were the early days at Practo like? When you are building a product that impacts healthcare of millions of people around the world and tens of thousands of doctors depend on it, you work constantly to improve it. This is what we do at Practo every day. We are constantly improving Practo Search in every way – whether it is new feature additions (like Patient Feedback) or geographic (more cities, countries) and service expansion (e.g. covering diagnostic centers), Practo search is improving on a daily basis to help consumers make better healthcare decisions by finding the best doctors and managing their records digitally. 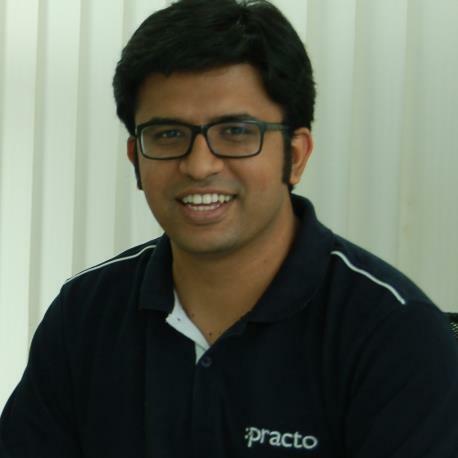 Practo.com currently has 1.5M users a month performing 4M searches. This is a 10x growth from last year. With Practo Ray we are on version 6 of our product and are seeing really strong adoption with over 30,000 doctors managing 10-12M appointments a month as well as 20M medical records being generated using Ray. How different is Practo’s model from others in the same segment? Well, first, there are really no other companies that are trying to solve the digital health problem for both doctors and patients simultaneously. Secondly, our decisions and models are guided by our ‘Patient first’ philosophy. This is why listing doctors on Practo.com is completely free. We do the due diligence of verification but don’t charge doctors for the listing. We also don’t charge doctors for any appointments booked with them via Practo.com; nor do we charge patients for finding doctors and booking appointments via practo.com. This ensures that we are able to offer the widest choice of doctors to the millions of patients visiting us every month. Now considering that we are aggregating patient demand via Practo Search and digitizing records and helping doctors manage practices via practo Ray, it puts us in a unique position to drive the interplay between the two services. For example, when a doctor writes a digital prescription, we could potentially send the consumer a reminder at the appropriate time for him to take his medication. We can also tell the consumer how long since he went in for his routine check-up. Both these drive healthier medical habits which are important in helping people live healthier. There are many more things that only we can do because of our unique position. Stay tuned. Lots more magic is coming. Was there anyone/anything who inspired you to manage Practo the way you do, and to define the culture it has? Our ultimate goal is to build an ever lasting enterprise that will continue to build great products long after we are gone. TATAs are a good example of this. We have always thought of Practo as a global company which happened to start in India. For this we follow the usual suspects – Google, Facebook, Apple. We are tuned to thinking long term and it’s normal for us to take bets which will pay off 5-10 years from now. In this regard, Elon Musk’s Tesla & SpaceX are a source of inspiration. Our biggest marketing strategy is building great products that impact lives of millions of people. And our biggest strength is being able to create a platform that connects patients and doctors while simultaneously digitizing all their healthcare data to enable them to make better more informed healthcare decisions every day. This requires behavioral change which is impossible to do unless you can create some really compelling experiences which is only possible if you own both the doctor and patient side of the play. Everywhere. We’re building a global product. Finding the best doctors and making better healthcare decisions is a global need and we are expanding extremely fast to serve this across the globe. For instance, in the next 12 months, we will expand from 6 cities to 35 cities in India. We will go from 3 countries we are currently present in to several more across South East Asia, Africa, Middle East and Latin America. So I expect us to continue to have significant growth on all fronts. Hiring at Practo is a serious affair. Every one in the senior leadership takes this seriously and interview people in their teams personally no matter what the position is. We are extremely choosy about who we let into our group because you need a very different energy level, mindset and attitude to be here. We are looking for people who can solve problems that no one in the world has even dared to solve before. No one has built products like us before so being able to look at a model that exists and get inspired from that is really not an option. It requires a whole new level of dedication, stubbornness and a commitment to the cause. We look for smart, creative, original thinkers with a serious can-do attitude who come up with solutions and not excuses. This is hard because not many people are real original thinkers. Having said that, we are nearly 700 people now and will be 1500 by December this year. Till I was 14, I was convinced I would open the batting for India. Only for my hopes to be dashed by my boards. From then on till I was 20, I wanted to be a stock broker. One thing I never in my wildest dreams thought I would want to do, till I was 20, was to start a company. By building the future everyone needs. Easiest way to win – Don’t give up. With a book in my hand or by watching a movie.